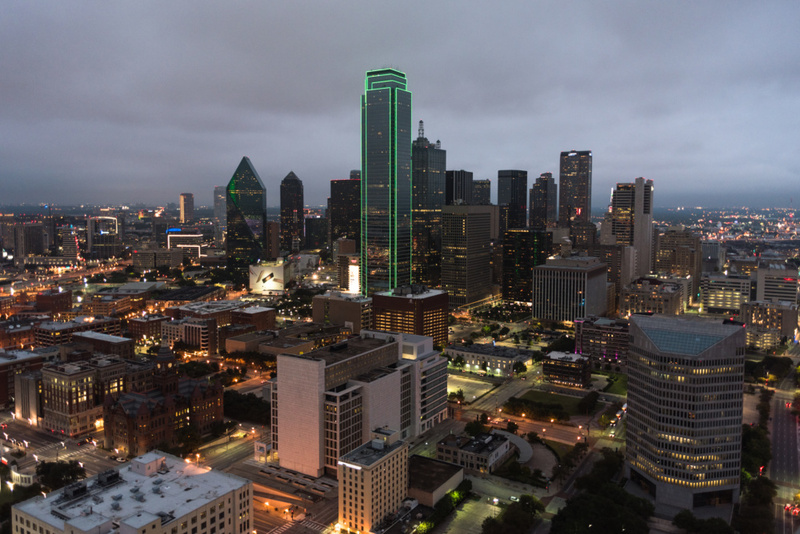 Texas is adding more people per year than any other state in the country, and with nearly 8 million residents, the Dallas-Fort Worth metropolitan area is the largest urban area in the state. On March 1, The Architect's Newspaper is bringing together architecture and development firms located within the metropolitan area for Facades+ Dallas, a fast-paced dialogue focusing on the region's tremendous growth and the projects reshaping it. Participants include 5G Studio Collaborative, CallisonRTKL, Harwood International, Merriman Anderson Architects, the CDC, L.A. Fuess Partners, Ibanez Shaw, Omniplan, DSGN Associates, Buchanan Architecture, Shipley Architects, Urban Edge Developers. Lauren Cadieux, associate at 5G Studio Collaborative, and Michael Friebele, associate at CallisonRTKL, are co-chairing the conference. In the lead up to Facades+ Dallas, AN sat down with Friebele to discuss trends within Dallas and CallisonRTKL's ongoing projects in the area and across the world. The Architect's Newspaper: To begin with, what facade-led projects are CallisonRTKL up to in Dallas and Texas as a whole? Michael Friebele: We are an interesting office in that we have a long-standing local reach here in Dallas-Fort Worth but also a broad depth of work around the globe. We often find it most interesting for us to take the international experience and find ways to apply those lessons throughout our work back home and likewise in the other direction. The collaboration between offices across CallisonRTKL really makes this possible. From a conceptual standpoint, our work on a vertical campus in Downtown Dallas took cues from many lessons we have learned abroad, from site response to contextual integration, and paired these attributes with an evolving corporate business model. Ultimately, the concept was shaped around an affordable housing project just to the east of the site, maintaining a view corridor through the gesture of a loop that ultimately became a symbol for the company’s programmatic model. It is one in a line of projects coming up in Texas that we are excited about. From a facade standpoint, our hospitality group is working on a Grand Hyatt Hotel in Kuwait that is currently under construction. The facade concept of self-shading finds a balance between the harsh climate of the region and the demand for expansive views. The pitch results in the natural placement of photovoltaics with the underside of the bay providing a highly transparent opening with minimal direct solar heat gain. The same team recently completed the core and shell of the Maike Business Center and Grand Hyatt in Xi’an. Here, two towers were linked by a belt truss to limit lateral loads while serving as a critical program link between the hotel and office towers. The facade was a simple extruded, serrated form linked in the middle by a vertical screen that emphasizes the composition. I am working currently on the design of two China-based projects with quite a range of scale between them. OCT Chengdu is on the larger side with a dominant facade facing a key convergence of traffic in the city. The facade plays into that movement with a series of fins that peel upward to reveal the activity of the mall behind, thus activating what is traditionally a hard face. We have been working further to optimize this system. This project is currently under construction and should be complete in a few years. On the other side of scale, we recently began work on an Audubon Center in Zhengzhou. The concept is about tying program and landscape together underneath an observation ring. We have been working with Thornton Tomasetti on realizing the ring as a completely unsupported element over the waterfront with full height curved glazing that reveals the public behind, as if the visitor were a part of the facade experience. The Zhengzhou project will start in construction in a few months and be complete by the middle of next year. AN: What unique opportunities and challenges are present for architects and designers in Dallas? MF: Mark Lamster summed it up well in a Dallas Morning News article from April of 2016, "Dallas Architecture is a joke (but it doesn't have to be)." In my opinion, the potential in Dallas is to be proactive rather than reactive toward challenging and evolving typologies but with that comes a certain degree of investment and risk. We can take lessons from two organizations that I believe have had the most impact upon the city in BC Workshop and Better Block. Both groups have been recognized for their innovative approaches to typologies and community engagement. The Cottages at Hickory Crossing is a noted example on the city’s south side. An engagement of our value as architects and designers to all parties involved in a project, from developer to community, is key, but change will also depend upon us stepping out and trying something without permission. As Dallas further evolves, there is no better place to test and experiment, but we have yet to really commit to that, beyond few examples. In all, it is really getting back to our fundamentals of why we practice this profession and to search for its meaning once again. AN: Which ongoing Dallas developments do you perceive to be the most exciting in terms of facade innovation and overall impact on the city? MF: There have been some noted transformations in Downtown Dallas, from work by Architexas on the Joule Hotel, to Merriman Anderson’s work on the Statler Hilton, all the way to more recent conversions of 400 Record by Gensler. Each of these, among others, have defined in many respects the process of historical rehabilitation in Texas, but also have transformed the program in all cases. Almost overnight, there is a developed rhythm toward respecting the past and redefining the urban realm. The Statler and 1401 Elm represent the largest and most challenging cases of preservation in the city. Statler was many years in the making. Historical innovations during the 1950s proved quite challenging in the rehab of the building. The results of maintaining such a celebrated form and period in the rehab are nothing short of a feat. 1401 Elm is currently undergoing its makeover, with the marble currently off-site for rehab. It has stalled a few times during recent years but hopefully, it will become a major contributor once again. Both projects are a glimpse into a city that is continually working to value its history more and more by the day. With our first panel, we hope to shed further light on this discussion. Further information regarding Facades+ Dallas may be found here. Only the wonkiest eyes light up when resource allocation is discussed in facts and figures, so architect Quilian Riano decided to have some fun in the Sun Belt with a game that reflects on two of the region's most pressing issues. Riano, founding principal of Brooklyn-based DSGN AGNC, created SANDBOXING, a pavilion that turns land and water scarcity into a puzzle and an urgent conversation. SANDBOXING asks players to divide the finite resources of land and water between themselves equitably—or not. Participants stake out a zone in the sandbox (a stand-in for developable land) and begin expanding their territory with the help of yellow wood dividers stacked outside the pavilion. When a player's building spree brushes up against another player's domain, the two are obligated to negotiate boundaries or fight shrewdly to get more land—a mirror of the real-time development battles that shape the Sun Belt. While these negotiations are underway, a working dew-catcher canopy collects moisture from the air, converting droplets to plentiful water for sandcastles. "The spatial regeneration in the sandbox shows how you can discuss larger issues through a game," Riano said. There are no winners, he explained, only open-ended discussions on how to share a finite resource. The pavilion was installed in November and fabricated locally by Ash studios. 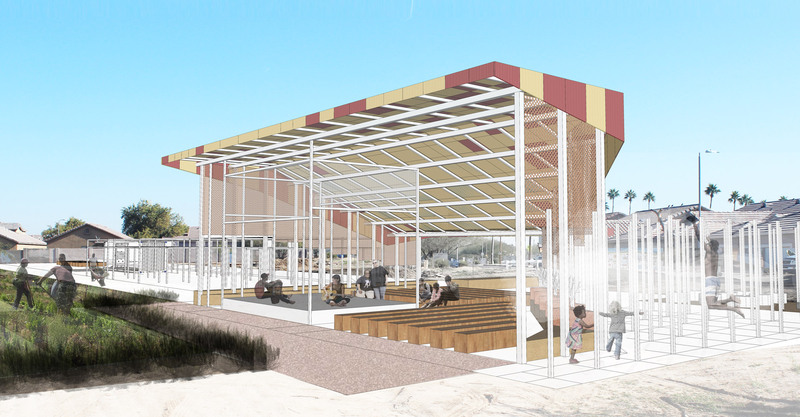 The pavilion debuted at Jubilee Park and Community Center in Old East Dallas, a predominantly black and Latino neighborhood, to coincide with New Cities Future Ruins' (NCFR) November conference. NCFR is a four-year initiative that invites designers, artists, and others to engage with the "extreme urbanism" of the western Sun Belt. The arid region—anchored by sprawling metropolises of Phoenix, Dallas, Houston, Los Angeles, and San Diego–Tijuana—is under ecological duress as suburban-style development devours desert ecosystems unable to support a growing population. Although the conference has wrapped, Riano said the community wanted to keep the installation close by, so Ash studios has agreed host it in a lot adjacent to its office, free and open to the public.